An electron microscope is a microscope that uses accelerated electrons as a source of illumination. Because the wavelength of an electron can be up to 100,000 times shorter than that of visible light photons, the electron microscope has a higher resolving power than a light microscope and can reveal the structure of smaller objects. A transmission electron microscope can achieve better than 50 pm resolution and magnifications of up to about 10,000,000x whereas most light microscopes are limited by diffraction to about 200 nm resolution and useful magnifications below 2000x. 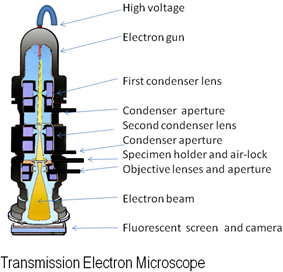 The transmission electron microscope uses electrostatic and electromagnetic lenses to control the electron beam and focus it to form an image. These electron optical lenses are analogous to the glass lenses of an optical light microscope. Electron microscopes are used to investigate the cells, large molecules, biopsy samples, metals, and crystals. Industrially, the electron microscope is often used for quality control and failure analysis. Modern electron microscopes produce electron micrographs, using specialized digital cameras or frame grabbers to capture the image. The first electromagnetic lens was developed in 1926 by Hans Busch. According to Dennis Gabor, the physicist Leó Szilárd tried in 1928 to convince Busch to build an electron microscope, for which he had filed a patent. German physicist Ernst Ruska and the electrical engineer Max Knoll constructed the prototype electron microscope in 1931, capable of four-hundred-power magnification; the apparatus was the first demonstration of the principles of electron microscopy. 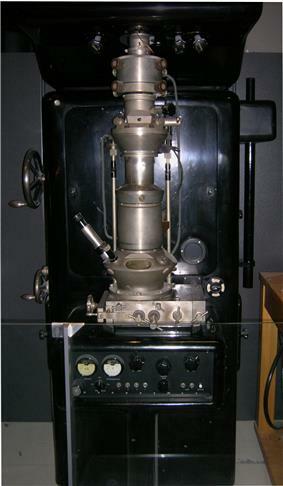 Two years later, in 1933, Ruska built an electron microscope that exceeded the resolution attainable with an optical (light) microscope. Moreover, Reinhold Rudenberg, the scientific director of Siemens-Schuckertwerke, obtained the patent for the electron microscope in May 1931. In 1932, Ernst Lubcke of Siemens & Halske built and obtained images from a prototype electron microscope, applying concepts described in the Rudenberg patent applications. Five years later (1937), the firm financed the work of Ernst Ruska and Bodo von Borries, and employed Helmut Ruska (Ernst’s brother) to develop applications for the microscope, especially with biological specimens. Also in 1937, Manfred von Ardenne pioneered the scanning electron microscope. The first practical electron microscope was constructed in 1938, at the University of Toronto, by Eli Franklin Burton and students Cecil Hall, James Hillier, and Albert Prebus; and Siemens produced the first commercial transmission electron microscope (TEM) in 1939. 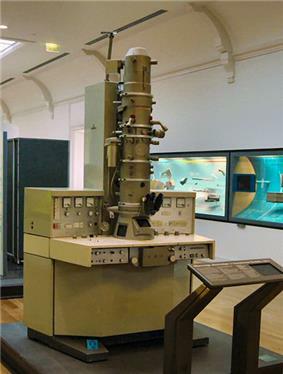 Although contemporary electron microscopes are capable of two million-power magnification, as scientific instruments, they remain based upon Ruska’s prototype. The original form of electron microscope, the transmission electron microscope (TEM) uses a high voltage electron beam to create an image. The electron beam is produced by an electron gun, commonly fitted with a tungsten filament cathode as the electron source. The electron beam is accelerated by an anode typically at +100 keV (40 to 400 keV) with respect to the cathode, focused by electrostatic and electromagnetic lenses, and transmitted through the specimen that is in part transparent to electrons and in part scatters them out of the beam. When it emerges from the specimen, the electron beam carries information about the structure of the specimen that is magnified by the objective lens system of the microscope. The spatial variation in this information (the "image") may be viewed by projecting the magnified electron image onto a fluorescent viewing screen coated with a phosphor or scintillator material such as zinc sulfide. Alternatively, the image can be photographically recorded by exposing a photographic film or plate directly to the electron beam, or a high-resolution phosphor may be coupled by means of a lens optical system or a fibre optic light-guide to the sensor of a CCD (charge-coupled device) camera. The image detected by the CCD may be displayed on a monitor or computer. Resolution of the TEM is limited primarily by spherical aberration, but a new generation of aberration correctors have been able to partially overcome spherical aberration to increase resolution. Hardware correction of spherical aberration for the high-resolution transmission electron microscopy (HRTEM) has allowed the production of images with resolution below 0.5 angstrom (50 picometres) and magnifications above 50 million times. The ability to determine the positions of atoms within materials has made the HRTEM an important tool for nano-technologies research and development. An important mode of TEM utilization is electron diffraction. The advantages of electron diffraction over X-ray crystallography are that the specimen need not be a single crystal or even a polycrystalline powder, and also that the Fourier transform reconstruction of the object's magnified structure occurs physically and thus avoids the need for solving the phase problem faced by the X-ray crystallographers after obtaining their X-ray diffraction patterns of a single crystal or polycrystalline powder. The major disadvantage of the transmission electron microscope is the need for extremely thin sections of the specimens, typically about 100 nanometers. Biological specimens are typically required to be chemically fixed, dehydrated and embedded in a polymer resin to stabilize them sufficiently to allow ultrathin sectioning. Sections of biological specimens, organic polymers and similar materials may require special treatment with heavy atom labels in order to achieve the required image contrast. Unlike the TEM, where electrons of the high voltage beam carry the image of the specimen, the electron beam of the scanning electron microscope (SEM) does not at any time carry a complete image of the specimen. The SEM produces images by probing the specimen with a focused electron beam that is scanned across a rectangular area of the specimen (raster scanning). When the electron beam interacts with the specimen, it loses energy by a variety of mechanisms. The lost energy is converted into alternative forms such as heat, emission of low-energy secondary electrons and high-energy backscattered electrons, light emission (cathodoluminescence) or X-ray emission, all of which provide signals carrying information about the properties of the specimen surface, such as its topography and composition. The image displayed by an SEM maps the varying intensity of any of these signals into the image in a position corresponding to the position of the beam on the specimen when the signal was generated. 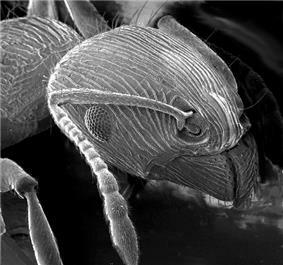 In the SEM image of an ant shown at right, the image was constructed from signals produced by a secondary electron detector, the normal or conventional imaging mode in most SEMs. Generally, the image resolution of an SEM is at least an order of magnitude poorer than that of a TEM. However, because the SEM image relies on surface processes rather than transmission, it is able to image bulk samples up to many centimetres in size and (depending on instrument design and settings) has a great depth of field, and so can produce images that are good representations of the three-dimensional shape of the sample. Another advantage of SEM is its variety called environmental scanning electron microscope (ESEM) can produce images of sufficient quality and resolution with the samples being wet or contained in low vacuum or gas. This greatly facilitates imaging biological samples that are unstable in the high vacuum of conventional electron microscopes. In their most common configurations, electron microscopes produce images with a single brightness value per pixel, with the results usually rendered in grayscale. However, often these images are then colorized through the use of feature-detection software, or simply by hand-editing using a graphics editor. This is usually for aesthetic effect or for clarifying structure, and generally does not add information about the specimen. In some configurations more information about specimen properties is gathered per pixel, usually by the use of multiple detectors. In SEM, the attributes of topography and material contrast can be obtained by a pair of backscattered electron detectors and such attributes can be superimposed in a single color image by assigning a different primary color to each attribute. Similarly, a combination of backscattered and secondary electron signals can be assigned to different colors and superimposed on a single color micrograph displaying simultaneously the properties of the specimen. In a similar method, secondary electron and backscattered electron detectors are superimposed and a colour is assigned to each of the images captured by each detector, with an end result of a combined colour image where colours are related to the density of the components. This method is known as Density-dependent colour SEM (DDC-SEM). Micrographs produced by DDC-SEM retain topographical information, which is better captured by the secondary electrons detector and combine it to the information about density, obtained by the backscattered electron detector. Density-Dependent Colour Scanning Electron Micrograph SEM (DDC-SEM) of cardiovascular calcification, showing in orange calcium phosphate spherical particles (denser material) and, in green, the extracellular matrix (less dense material). Some types of detectors used in SEM have analytical capabilities, and can provide several items of data at each pixel. Examples are the Energy-dispersive X-ray spectroscopy (EDS) detectors used in elemental analysis and Cathodoluminescence microscope (CL) systems that analyse the intensity and spectrum of electron-induced luminescence in (for example) geological specimens. In SEM systems using these detectors it is common to color code the signals and superimpose them in a single color image, so that differences in the distribution of the various components of the specimen can be seen clearly and compared. Optionally, the standard secondary electron image can be merged with the one or more compositional channels, so that the specimen's structure and composition can be compared. Such images can be made while maintaining the full integrity of the original signal, which is not modified in any way. In the reflection electron microscope (REM) as in the TEM, an electron beam is incident on a surface but instead of using the transmission (TEM) or secondary electrons (SEM), the reflected beam of elastically scattered electrons is detected. This technique is typically coupled with reflection high energy electron diffraction (RHEED) and reflection high-energy loss spectroscopy (RHELS). Another variation is spin-polarized low-energy electron microscopy (SPLEEM), which is used for looking at the microstructure of magnetic domains. The STEM rasters a focused incident probe across a specimen that (as with the TEM) has been thinned to facilitate detection of electrons scattered through the specimen. The high resolution of the TEM is thus possible in STEM. The focusing action (and aberrations) occur before the electrons hit the specimen in the STEM, but afterward in the TEM. The STEMs use of SEM-like beam rastering simplifies annular dark-field imaging, and other analytical techniques, but also means that image data is acquired in serial rather than in parallel fashion. Often TEM can be equipped with the scanning option and then it can function both as TEM and STEM. Chemical fixation – for biological specimens aims to stabilize the specimen's mobile macromolecular structure by chemical crosslinking of proteins with aldehydes such as formaldehyde and glutaraldehyde, and lipids with osmium tetroxide. Negative stain – suspensions containing nanoparticles or fine biological material (such as viruses and bacteria) are briefly mixed with a dilute solution of an electron-opaque solution such as ammonium molybdate, uranyl acetate (or formate), or phosphotungstic acid. This mixture is applied to a suitably coated EM grid, blotted, then allowed to dry. Viewing of this preparation in the TEM should be carried out without delay for best results. The method is important in microbiology for fast but crude morphological identification, but can also be used as the basis for high resolution 3D reconstruction using EM tomography methodology when carbon films are used for support. Negative staining is also used for observation of nanoparticles. Cryofixation – freezing a specimen so rapidly, in liquid ethane, and maintained at liquid nitrogen or even liquid helium temperatures, so that the water forms vitreous (non-crystalline) ice. This preserves the specimen in a snapshot of its solution state. An entire field called cryo-electron microscopy has branched from this technique. With the development of cryo-electron microscopy of vitreous sections (CEMOVIS), it is now possible to observe samples from virtually any biological specimen close to its native state. Dehydration – ethanol or acetone, followed by critical point drying or infiltration with embedding resins. Embedding, biological specimens – after dehydration, tissue for observation in the transmission electron microscope is embedded so it can be sectioned ready for viewing. To do this the tissue is passed through a 'transition solvent' such as Propylene oxide (epoxypropane) and then infiltrated with an epoxy resin such as Araldite, Epon, or Durcupan; tissues may also be embedded directly in water-miscible acrylic resin. After the resin has been polymerized (hardened) the sample is thin sectioned (ultrathin sections) and stained – it is then ready for viewing. Embedding, materials – after embedding in resin, the specimen is usually ground and polished to a mirror-like finish using ultra-fine abrasives. The polishing process must be performed carefully to minimize scratches and other polishing artifacts that reduce image quality. Metal shadowing Metal (e.g. platinum) is evaporated from an overhead electrode and applied to the surface of a biological sample at an angle. This is followed by a dissolution of the biological material in an acid bath leaving only the metallic surface replica intact. This metallic surface replica can then be examined using transmission electron microscopy. Variations in the thickness and angle of the metal surface allows an image to be formed since incident electrons will scatter in different directions rather than pass through it. Sectioning – produces thin slices of specimen, semitransparent to electrons. These can be cut on an ultramicrotome with a diamond knife to produce ultra-thin slices about 60–90 nm thick. Disposable glass knives are also used because they can be made in the lab and are much cheaper. Staining – uses heavy metals such as lead, uranium or tungsten to scatter imaging electrons and thus give contrast between different structures, since many (especially biological) materials are nearly "transparent" to electrons (weak phase objects). In biology, specimens can be stained "en bloc" before embedding and also later after sectioning. Typically thin sections are stained for several minutes with an aqueous or alcoholic solution of uranyl acetate followed by aqueous lead citrate. Freeze-fracture or freeze-etch – a preparation method particularly useful for examining lipid membranes and their incorporated proteins in "face on" view. The fresh tissue or cell suspension is frozen rapidly (cryofixation), then fractured by simply breaking or by using a microtome while maintained at liquid nitrogen temperature. The cold fractured surface (sometimes "etched" by increasing the temperature to about −100 °C for several minutes to let some ice sublime) is then shadowed with evaporated platinum or gold at an average angle of 45° in a high vacuum evaporator. A second coat of carbon, evaporated perpendicular to the average surface plane is often performed to improve stability of the replica coating. The specimen is returned to room temperature and pressure, then the extremely fragile "pre-shadowed" metal replica of the fracture surface is released from the underlying biological material by careful chemical digestion with acids, hypochlorite solution or SDS detergent. The still-floating replica is thoroughly washed free from residual chemicals, carefully fished up on fine grids, dried then viewed in the TEM. Ion beam milling – thins samples until they are transparent to electrons by firing ions (typically argon) at the surface from an angle and sputtering material from the surface. A subclass of this is focused ion beam milling, where gallium ions are used to produce an electron transparent membrane in a specific region of the sample, for example through a device within a microprocessor. Ion beam milling may also be used for cross-section polishing prior to SEM analysis of materials that are difficult to prepare using mechanical polishing. Conductive coating – an ultrathin coating of electrically conducting material, deposited either by high vacuum evaporation or by low vacuum sputter coating of the sample. This is done to prevent the accumulation of static electric fields at the specimen due to the electron irradiation required during imaging. 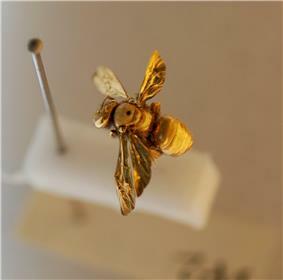 The coating materials include gold, gold/palladium, platinum, tungsten, graphite, etc. Earthing – to avoid electrical charge accumulation on a conductive coated sample, it is usually electrically connected to the metal sample holder. Often an electrically conductive adhesive is used for this purpose. 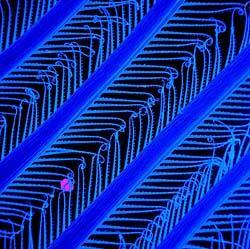 Pictured: First degree filter setae with a V pattern of second degree setae pointing towards the inside of the feeding basket. The purple ball is 1 µm in diameter. Electron microscopes are expensive to build and maintain, but the capital and running costs of confocal light microscope systems now overlaps with those of basic electron microscopes. 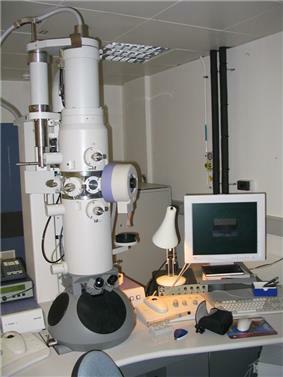 Microscopes designed to achieve high resolutions must be housed in stable buildings (sometimes underground) with special services such as magnetic field cancelling systems. The samples largely have to be viewed in vacuum, as the molecules that make up air would scatter the electrons. One exception is the environmental scanning electron microscope, which allows hydrated samples to be viewed in a low-pressure (up to 20 Torr or 2.7 kPa) and/or wet environment. Scanning electron microscopes operating in conventional high-vacuum mode usually image conductive specimens; therefore non-conductive materials require conductive coating (gold/palladium alloy, carbon, osmium, etc.) Low-voltage mode of modern microscopes makes possible observation of non-conductive specimens without coating. Non-conductive materials can be imaged also by a variable pressure (or environmental) scanning electron microscope. Small, stable specimens such as carbon nanotubes, diatom frustules and small mineral crystals (asbestos fibres, for example) require no special treatment before being examined in the electron microscope. Samples of hydrated materials, including almost all biological specimens have to be prepared in various ways to stabilize them, reduce their thickness (ultrathin sectioning) and increase their electron optical contrast (staining). These processes may result in artifacts, but these can usually be identified by comparing the results obtained by using radically different specimen preparation methods. It is generally believed by scientists working in the field that as results from various preparation techniques have been compared and that there is no reason that they should all produce similar artifacts, it is reasonable to believe that electron microscopy features correspond with those of living cells. Since the 1980s, analysis of cryofixed, vitrified specimens has also become increasingly used by scientists, further confirming the validity of this technique. ^ a b Erni, Rolf; Rossell, MD; Kisielowski, C; Dahmen, U (2009). "Atomic-Resolution Imaging with a Sub-50-pm Electron Probe". Physical Review Letters 102 (9): 096101. ^ a b c Ruska, Ernst (1986). "Ernst Ruska Autobiography". Nobel Foundation. Retrieved 2010-01-31. ^ Rudenberg, H Gunther and Rudenberg, Paul G (2010). "Chapter 6 – Origin and Background of the Invention of the Electron Microscope: Commentary and Expanded Notes on Memoir of Reinhold Rüdenberg". Advances in Imaging and Electron Physics 160. Elsevier. ^ Kruger DH, Schneck P, Gelderblom HR (May 2000). "Helmut Ruska and the visualisation of viruses". Lancet 355 (9216): 1713–7. ^ von Ardenne, M and Beischer, D (1940). "Untersuchung von metalloxyd-rauchen mit dem universal-elektronenmikroskop". Zeitschrift Electrochemie (in German) 46: 270–277. ^ "James Hillier". Inventor of the Week: Archive. 2003-05-01. Retrieved 2010-01-31. ^ "The Scale of Things". Office of Basic Energy Sciences, U.S. Department of Energy. 2006-05-26. Retrieved 2010-01-31. ^ O'Keefe MA, Allard LF. "Sub-Ångstrom Electron Microscopy for Sub-Ångstrom Nano-Metrology" (pdf). Information Bridge: DOE Scientific and Technical Information – Sponsored by OSTI. Retrieved 2010-01-31. ^ Burgess, Jeremy (1987). Under the Microscope: A Hidden World Revealed. CUP Archive. p. 11. ^ "Introduction to Electron Microscopy". FEI Company. p. 15. Retrieved 12 December 2012. ^ Antonovsky, A. (1984). "The application of colour to sem imaging for increased definition". Micron and Microscopica Acta 15 (2): 77–84. ^ Danilatos, G.D. (1986). "Colour micrographs for backscattered electron signals in the SEM". Scanning 9 (3): 8–18. ^ Danilatos, G.D. (1986). "Environmental scanning electron microscopy in colour". J. Microscopy 142: 317–325. ^ a b Bertazzo, S.; Gentleman, E.; Cloyd, K. L.; Chester, A. H.; Yacoub, M. H.; Stevens, M. M. (2013). "Nano-analytical electron microscopy reveals fundamental insights into human cardiovascular tissue calcification". Nature Materials 12 (6): 576–583. ^ "SPLEEM". National Center for Electron Microscopy (NCEM). Retrieved 2010-01-31. ^ Luft, J.H. (1961). "Improvements in epoxy resin embedding methods". The Journal of biophysical and biochemical cytology 9 (2). p. 409. ^ Adrian, Marc; Dubochet, Jacques; Lepault, Jean; McDowall, Alasdair W. (1984). "Cryo-electron microscopy of viruses". Nature 308 (5954): 32–36. ^ Sabanay, I.; Arad, T.; Weiner, S.; Geiger, B. (1991). "Study of vitrified, unstained frozen tissue sections by cryoimmunoelectron microscopy". Journal of Cell Science 100 (1): 227–236. ^ Kasas, S.; Dumas, G.; Dietler, G.; Catsicas, S.; Adrian, M. (2003). "Vitrification of cryoelectron microscopy specimens revealed by high-speed photographic imaging". Journal of Microscopy 211 (1): 48–53. Nanohedron.com|Nano image gallery beautiful images generated with electron microscopes. electron microscopy Website of the ETH Zurich: Very good graphics and images, which illustrate various procedures. FEI Image Contest FEI has a microscope image contest every year since 2008. Eva Nogales's seminar: "Introduction to Electron Microscopy"
Rubin Borasky Electron Microscopy Collection, 1930–1988 Archives Center, National Museum of American History, Smithsonian Institution.